Grab your beer and bring your friends, because it might get cold without them. We even brought the dog, hoping he likes fish. We were the newbies out on the lake. 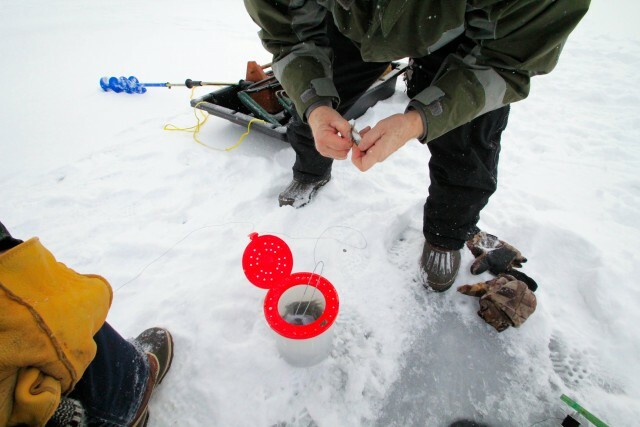 My father, my friend Adam, and I had never been out ice fishing before. The last time I was out on a frozen lake I had skates on my feet, a hockey stick in hand, and a puck heading for nothing but net. 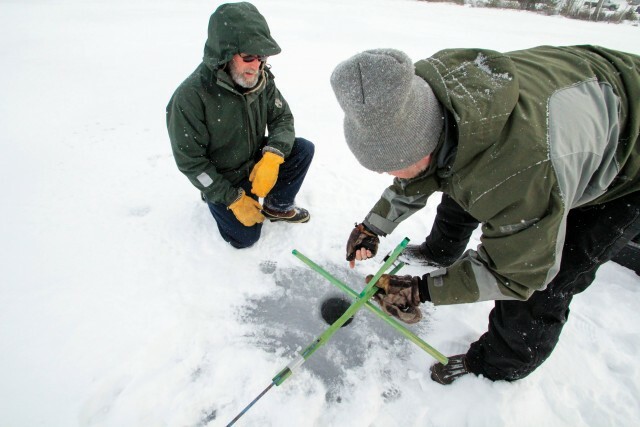 Drilling holes in the ice wouldn’t go over so well for pond hockey. 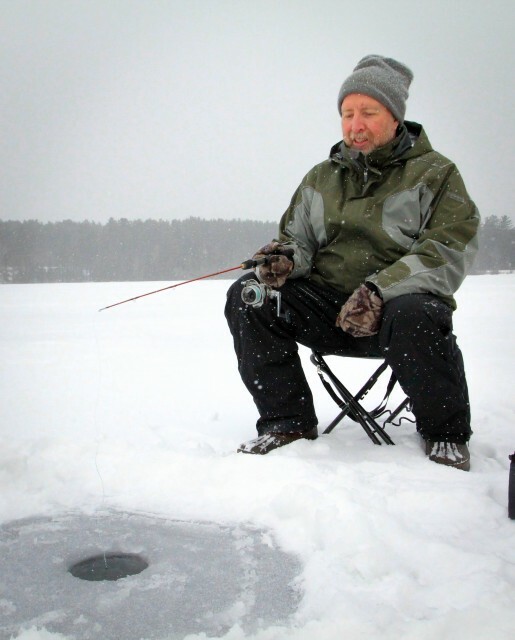 We all needed the guidance of our good friend Les who is a pretty seasoned ice fisherman. We all met up at Franklin Falls Flow. If you’re coming from Wilmington, it's right over the other side of Whiteface Mountain. I spent the first couple years of my life out here in Franklin Falls, just off of Plank Road. Since then my family has moved away, not too far, however it's been quite a long time since I have done anything out here on the lake. 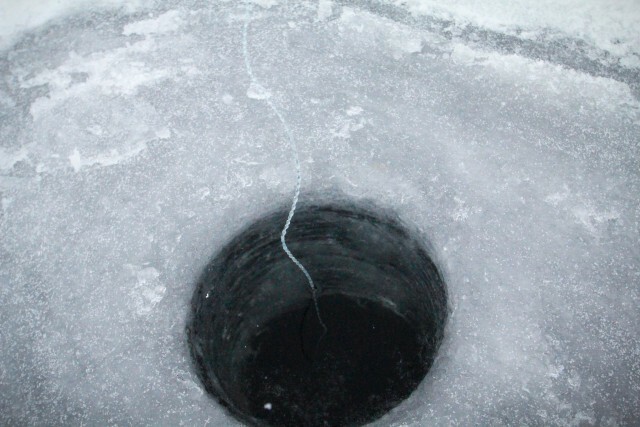 I do believe this was the first place I had ice fished before. 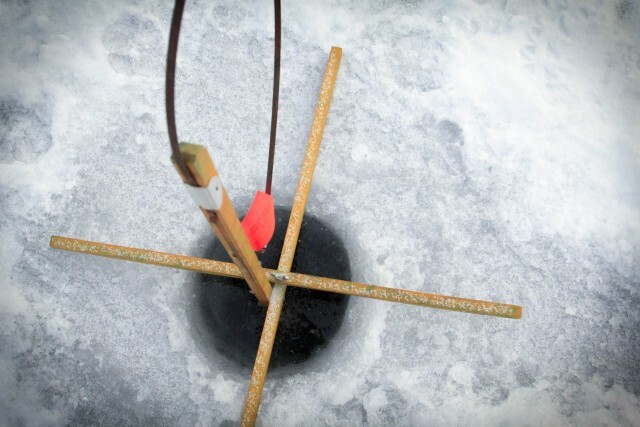 I mentioned that I had never ice fished, and that is because I was way too young to even remember a single thing about it. While we were out there during this trip, my father shared stories with me about being out on the lake when I was really young, things I couldn’t recall in the least. So, yes, I feel I can claim I've “never” ice fished before, and Franklin Falls Flow seemed like the place to begin. It is one of my favorite ponds and offers one of my favorite scenic views during the summer. I picked a pretty chilly day, but we were all bundled up and well adapted to deal with the cold. The dog, Zorro, even had his own coat and we wrapped him up in a blanket as we all huddled around waiting for the catch. We ended up drilling about ten holes. I was not prepared for this. Zorro found it exciting but Adam and I quickly wished we had a gas auger. This auger needed all of our muscle power. Les and my father made it look so easy. We on the other hand struggled quite a bit, but we were determined to break through the ice and not let it defeat us. The ice was about a foot thick. Honestly, I was a bit surprised and always thought it had to be a lot thicker for the lake to be safe enough to walk on, but this was normal and perfectly safe. My favorite part for some reason came after we drilled the hole. I liked scooping all of the ice out and seeing how thick it was – maybe I liked it because that was the easy part of the whole process. Zorro was determined to use it as his water bowl when he wasn't dining on the snow around us. I was fascinated by the whole set up. Les brought a bunch of tip-ups. 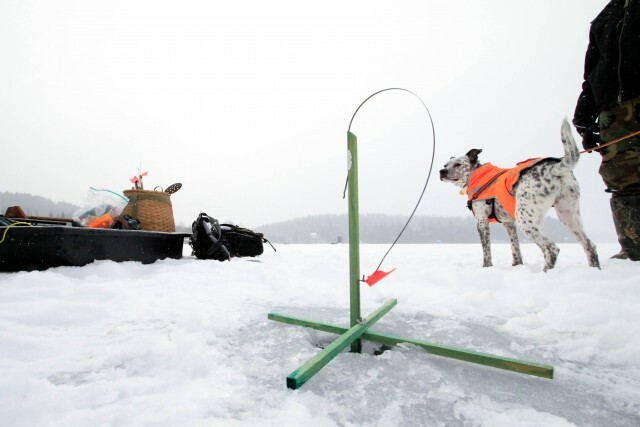 I originally thought that we would be drilling a couple of holes and using a fishing rod to catch the fish. You know, just like in the summer, but on ice. This was a whole different ordeal. He showed us how to find the depth of the lake in order to know where to place the bait fish on the line so that it was a couple feet off the bottom. I thought the lake was going to be a lot deeper where we set up, but we were still fairly close to the shore. Apparently, when the fish bites onto the hook, the flag on the tip-up will shoot up, letting us know we possibly caught a fish. Finally once all the tip-ups were in place, we drilled the final hole. This wasn’t for another tip-up; this one was actually for a rod. This is what they call jigging. So I sat there with the rod fishing over the hole. I watched the line bead up with frozen water droplets as it came in and out of the water. I didn’t have much luck fishing this summer, so I was hoping to snag a big pike. As we sat there a few tip-ups went off on both sides of us. Unfortunately for us they weren’t ours. They were our neighbors on the ice. We watched them all scurry out of their shanties and over to the flags. We definitely heard a cheer or two as they came up with a few fish. 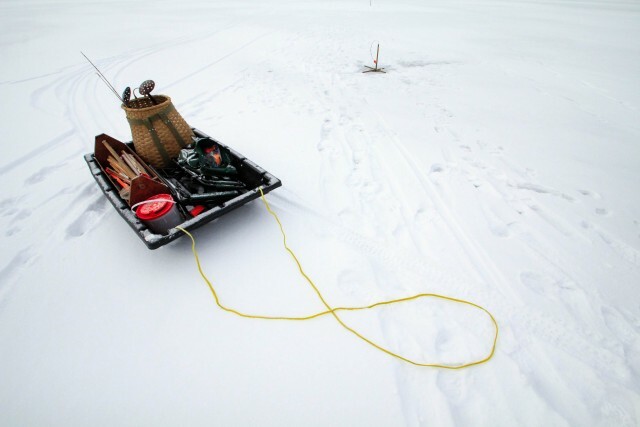 After a couple hours on the ice, we packed up our gear and threw it on the sled. 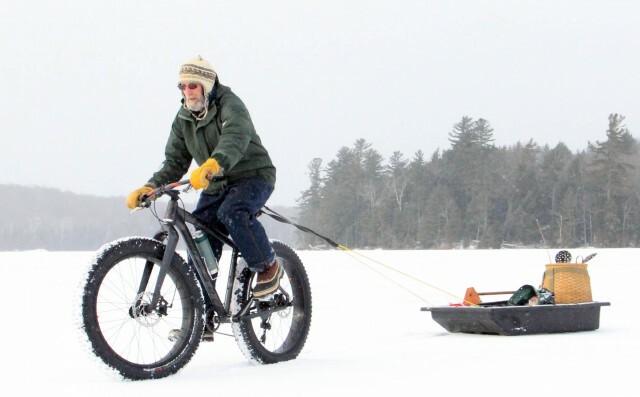 My father found a great use for his fat tire bike and towed the sled back to the car. Overall, I think if we had a little more time and a slightly warmer day, we would have caught some fish. Now that I've got the hang of things, I’d like to go back out again and give it a try.